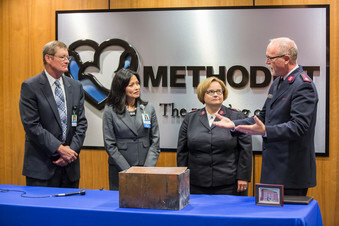 The construction crews who demolished the bricks of the cornerstone surrounding the old Methodist Hospital at 36th and Cuming streets had no idea of the historic treasures tucked inside. Learn more in this blog by MHS PR/Social Media Specialist Katina Granger, with photos by MHS Multimedia Specialist Daniel Johnson. See media coverage of the event from Omaha World-Herald, KETV, KFAB and KPTM.